This lamp is a second project from ‘Parametric Modeling and CAM Technologies’ seminar which was finally fabricated and assembled. 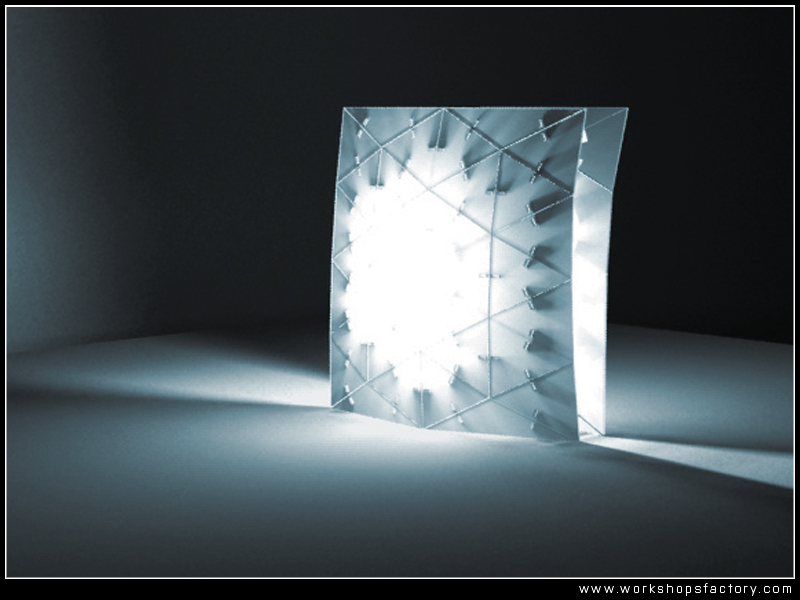 The idea of the design proposal was to create a lamp which starts from two double-curved surfaces. For this reason Generative Components scripts takes two double curved surfaces as an input and transforms them into mesh with special cuttings and joints in between. 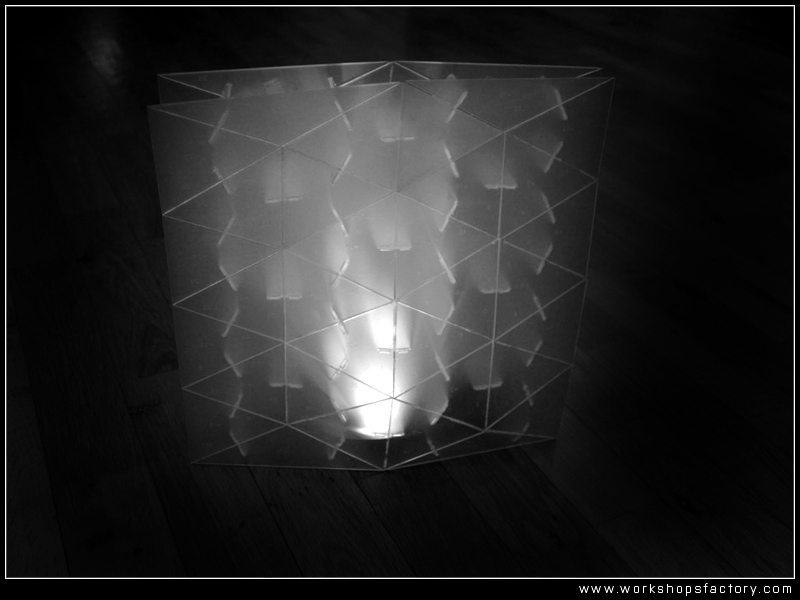 Final form was laser-cut out of 1mm semi-transparent plexiglass. The project was done by: M.Brzeski, A. Rokicka, M. Rudnicki, D. Pędrakowski, P. Michalak under tutorship of Workshop Factory. 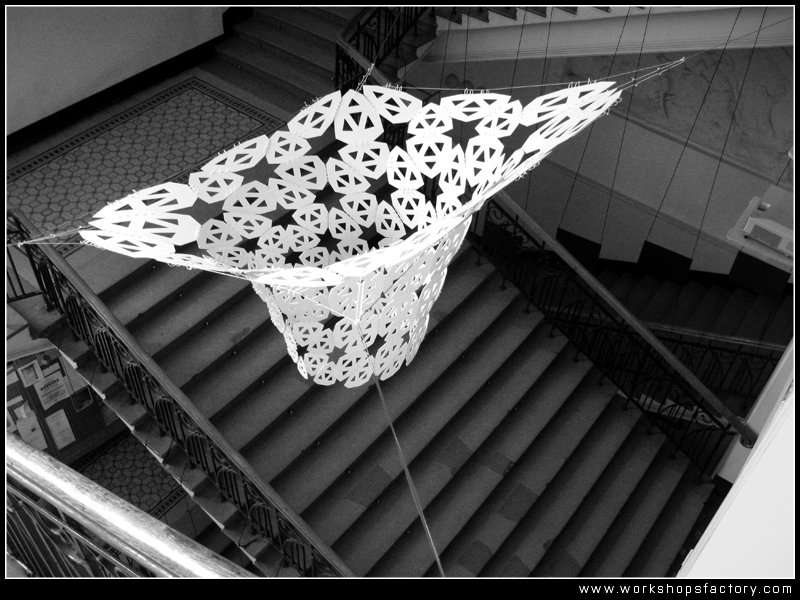 At the end of February one of the projects done during ‘Parametric Modeling and CAM Technologies’ seminar was finally assembled and installed in the main hall of the building of Warsaw University of Technology (WAPW). 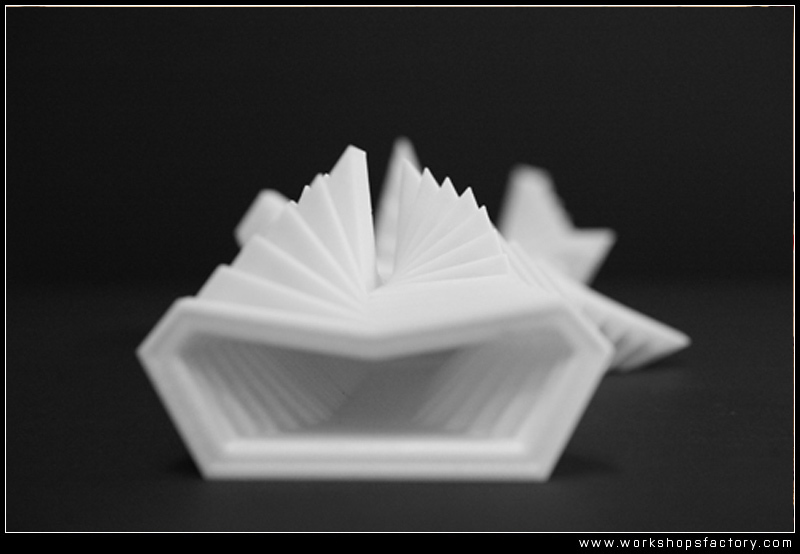 It is a result of a fall semester master course seminar at the WAPW, which was tutored by Workshops Factory. 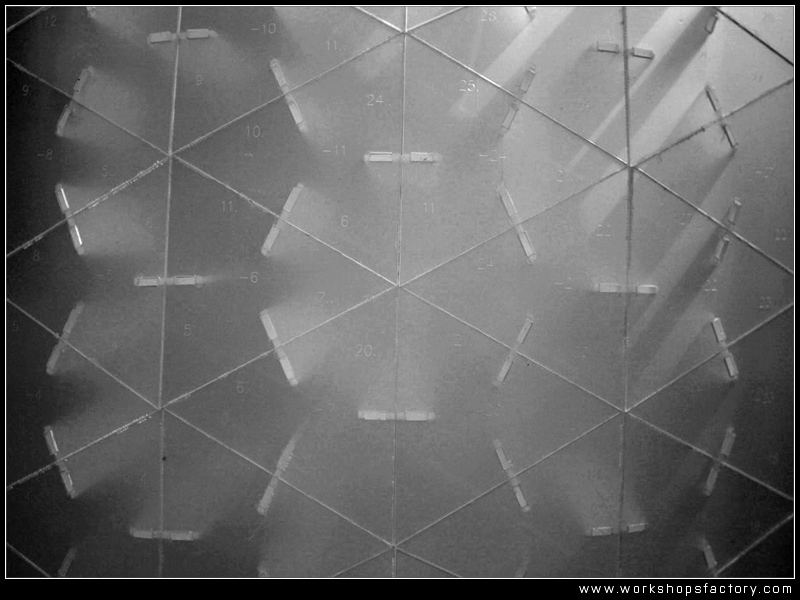 Fabricated project was designed by J. Bartos, M.Piotrowska, J. Soltyk and A. Zajkowski. On the 26th February (Friday) at 12.00 at the Warsaw University of Technology / Architecture Faculty (ul. Koszykowa 55, Warsaw) final review of the seminar and projects exhibition will take place. You are welcome to join if You are around. Video presents fabrication and assembling process of the project. The overall geometry of the design proposal was designed by using Bentley’s Generative Components, which allows controlling form by a set of parameters. One of the student projects done during ‘Parametric Modeling and CAM Technologies’ seminar was finally chosen for fabrication in 1:1 scale (group 01: J.Bartos, M.Piotrowska, J. Soltyk, A. Zajkowski). 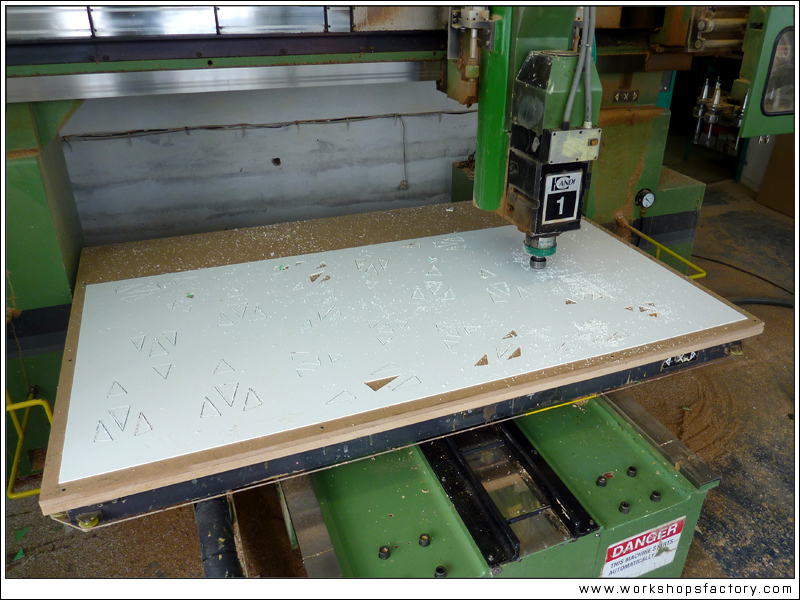 2 axis CNC milling machine was used to cut all the elements of the design proposal. Because of its lightness and rigidity PCV was chosen as the best material for the manufacturing. We would like to thank NC.art for their colaboration in fabrication process. 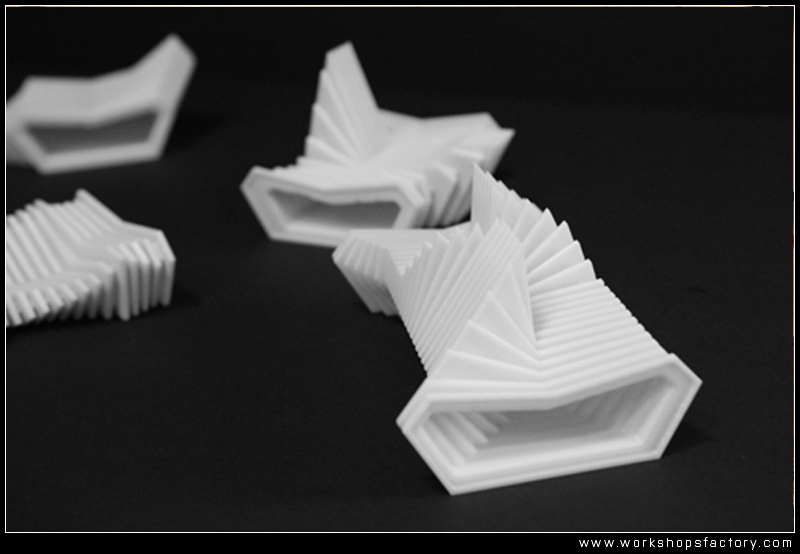 ‘Parametric Modeling and CAM Technologies’ was a seminar run during a master course at the Warsaw University of Technology (WAPW). Its aim was to introduce parametric software and the CNC manufacturing processes to the students. Thus the classes started with the theoretical introduction to computational processes in architecture and Bentley’s Generative Components tutorials. Later on the students were divided into four groups of 3-4 people working separately on their designs. 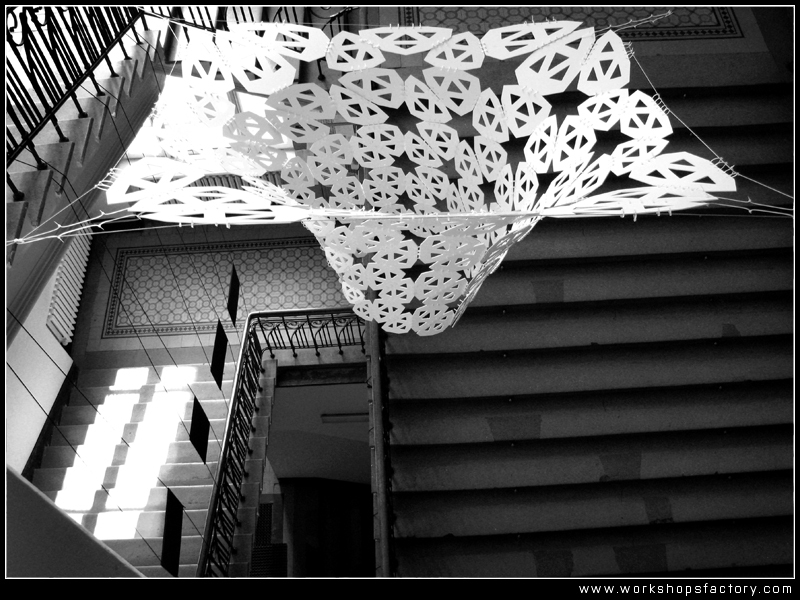 The subject of the studio project was a design of a three dimensional installation in the space of the main staircase at the WAPW building. One of the main objectives of the studio was to fabricate one or two of the installations using a 2-axis milling machine or laser cutter. The idea of the project was to separate certain part of the staircase area from its overall space. Thus the shape of the project starts from a simple rectangle and the gradually offers semi closed space at its lower level. Both global shape of the design and its local components details are parametrically driven by a set of parameters. 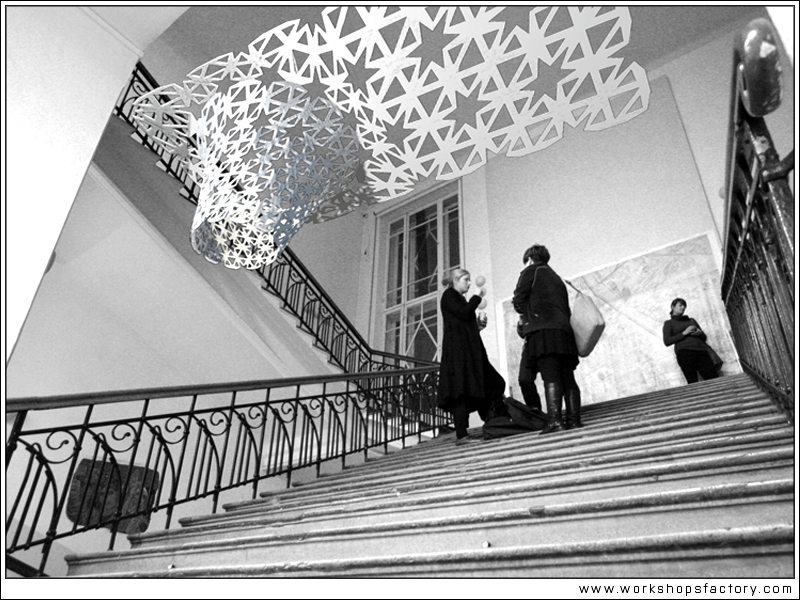 The project is going to be fabricated (in collaboration with NC.art company) and installed in the main hall of Warsaw University of Technology. The video presents the process of generating geometry of the project in Bentley’s Genertive Components and the way of controlling specific dimensions by certain parameters. The concept of the design proposal was to design a lamp, which would follow the shape of the handrail, and would be parametrically controlled by the ammount of light it produces. And so the main curve represents the border of the enlighten area, and then the form adjusts to its requirments. Furthermore all the structural parts are parametrically controlled by a set of sliders. 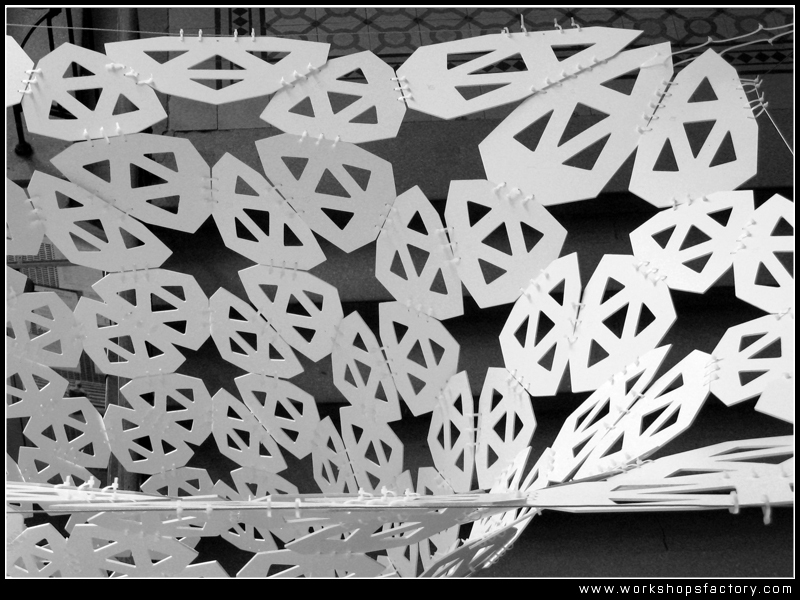 The design proposes a parametric wall which can work for different types of exhibition (phtotos, architectural projects, drawings, etc). It is driven by a set of parameters like the overall shape of the wall, possible openings in between, sizes of the modules or thickness of the material. 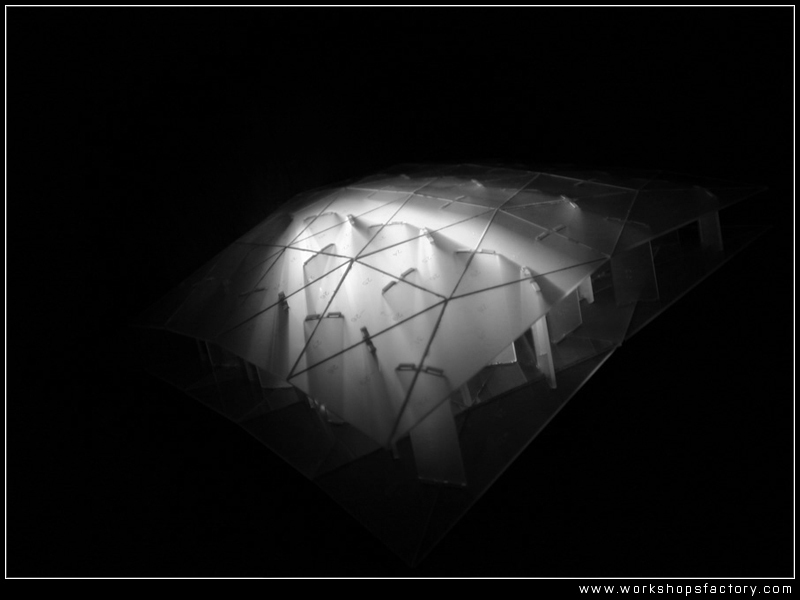 The idea of the project was to create a lamp which starts from two double-curved surfaces. For this reason GC script has been developed as a tool for conversion of two double-curved surfaces in two meshes made of triangles, that are interconnected to ensure stability of construction. Depending on version base geometry may be imported from external file or be generated inside the script. Three different iterations of the project are going to be fabricated in 1:1 scale. We would like thank to WAPW (Pracownia Projektowania Architektonicznego Wspomaganego Komputerem – Katedra Projektowania Architektonicznego, kierownik katedry: J. Slyk) for their help in organizing the class and to all the students participating in the course for their effort. More information about final results of the seminar will be posted soon.